Carl Zeiss Ltd, a global market leader in precision optics and engineering technology, has specified the Rigel Medical 62353 medical safety analyser to comply with IEC 62353, the standard for in-service and after repair testing of medical electronic devices. 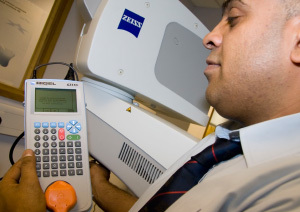 This move has led to improvements in the testing of hundreds of electrically powered operating microscopes and ophthalmic diagnostic devices which Carl Zeiss supplies and supports throughout the UK to the NHS trusts, private hospitals and high street optometrists. Using the Rigel Medical 62353 provides a cost effective, versatile and highly portable testing solution, enabling Carl Zeiss service engineers to quickly and accurately check the safety of upwards of 300 different Zeiss products per week at dozens of locations throughout the UK. Twenty Rigel Medical 62353 units were initially supplied combining the benefits of an automatic and manual tester with advanced data logging which provides improved management reporting. Roy Scales, service manager at Carl Zeiss, said the ability to store and manage thousands of test records was highly beneficial to engineers moving quickly from site-to-site. Also the capacity to customise test routines, visual inspections and performance tests, which can be downloaded to and from a PC, was advantageous and has helped to improve in-service testing capacity. He added: “The Rigel Medical 62353 is a very good, highly reliable instrument which not only enables us to comply with the European standard but has definitely helped us ensure our products are safe to use. “It’s intuitive, easy-to-use and compactness is appreciated by our engineers. The Rigel Medical 62353 is the first dedicated IEC 62353 safety analyser offering automatic sequencing, onboard data storage and data entry in a lightweight, easy-to-carry enclosure. Improved battery power provides extended operating life while the instrument’s lightweight feature makes it extremely practical and easy-to-transport from site-to-site. Features include an easy-to-use facility for testing up to two individual Applied Parts from different modules or classes e.g. BF and CF class and either fully automatic, semi automatic or manual testing. A full graphic LCD display has been incorporated with an integral alpha-numeric ABCD keyboard for quick and accurate operation.